Humans have developed the ability to multitask: they’ll be snacking and texting at the same time, all while keeping their eyes glued on the Netflix interface. With this super-talent, however, comes a first-world problem: greasy phone screens. Thankfully, Japan—one of the most tech-savvy nations in the world—has an answer for consumers who are too busy munching and using their phones all at once. 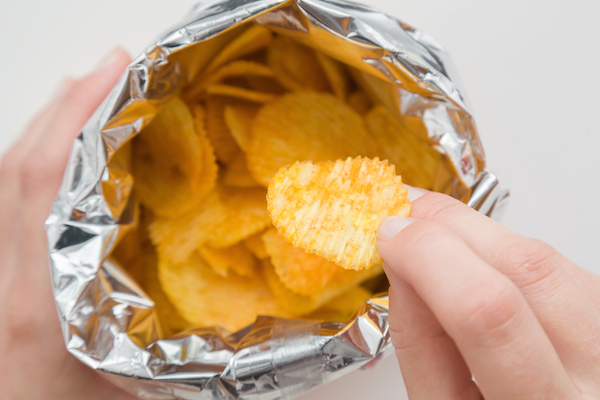 It’s “drinkable” potato chips: once you sip, the grease won’t drip. According to The Wall Street Journal, Tokyo-based snack maker Koike-ya has developed ‘One Hand Chips’, a snack that lets you indulge in the taste of potato chips without having to touch one. The ‘One Hand Chips’ come pre-smashed, which means snackers can essentially drink them, absolving them the need to chew. “I can just take it and chug it,” a fan tells the newspaper. The idea mirrors KFC’s synthetic finger, which enables diners to use their phones without mucking them with fried chicken grease.